The Hatfield McCoy Regional Recreation Authority (Authority) has reached a verbal agreement with the Coal Company (Company) on a solution to keep the Pocahontas Trail System open. The Authority and Company will work in a cooperative manner to address outstanding issues such as: outlaw trail riding, trespassing onto bonded Company operations and the need for increased law enforcement for the Pocahontas and surrounding trail systems. The February 1, 2019 temporary closure date has been lifted and the Pocahontas Trail System will remain open after that date. The Authority, Company and the State of West Virginia will continue working on these and other outstanding issues to ensure a permanent solution for the Pocahontas Trail System. The Authority would like to express its gratitude to the Company for their continued support during this time. Most noted for… One Third of the largest continuous areas of the HMT network along with Pinnacle Creek & Indian Ridge trail systems and connectors. Pocahontas Trail System links up to two other Hatfield- McCoy Trail Systems—Indian Ridge and Pinnacle Creek— making for the most continuous miles of trails east of the Mississippi. The trailhead is located in Coaldale, just outside of the town of Bramwell, historically known for its numerous millionaire homes from the early 20th century. This trail system has direct access to gas, food and lodging. These cabins are located on half mile off of the Hatfield McCoy trail 16 Pocahontas System. Ride to the trail in one minute! Completely furnished with everything you will need for your stay. One queen bed, four twin beds, full kitchen and bath. Private setting, mountain top view! Welcome to Sam's Guest Houses in Northfork, WV where all trails lead! There are 4 comfortable homes located in the center of 4 trail systems. We have first class accommodations for up to 54 guests. All of our accommodations are newly updated and offer central air, smart tv's, cable, wifi, mudrooms, 2 bathrooms per lodge, fully equipped kitchens, bbq's, fire pits, laundry and many more comforts for your enjoyment. We are a short ride to fuel, restaurants, retail and historic sites. So stay with us at Sam's Guest Houses and enjoy all the West Virginia Trail Systems have to offer!! We hope to see you in person soon! We offer 4 houses that we rent out. We also offer tent sites as well as plenty of parking! We are fully equipped (sheets, towels, pots, pans, dishes, etc. ), everything you will need for an enjoyable time with us. We thank everyone who has been visiting with us for the past four years and we look forward to meeting lots of new friends! Located in Bluewell, WV just minutes away from Pocahontas Trail Head in Bramwell, WV. We offer newly constructed cabins, with all new furnishings, that are conveniently located to restaurants, gas station, ATV shop, Dollar General and local attractions. You will be able to park your vehicles in our large lot, unload and just ride your ATVs anywhere in town. All linens and towels are provided as well as cable TV, wifi, fire pits, charcoal grills, ATV wash station, keypad gated entrance, heating and air conditioning. When your at the end of your stay we are located only 20 minutes from the interstate to get you back on your way home. Two rental homes available for nightly/weekly rental. The Bear Den sleeps 12 and is available to rent year round. The Deer Lodge sleeps 7 and is available for rent year round. Both homes are located in Abb's Valley; approximtely 11.9 miles from the Hatfield McCoy Trails. We offer cabin rentals, full hook-up RV sites, general store, high octane non-ethanol fuel, food, souvenirs, garage, tires, parts, and accessories. Everything is in one convenient location for your adventure. Why stay with us? We have lived here all our life. We know the trails and the history. This is more than just a job for us. This is our opportunity to show you what West Virginia hospitality is all about. As the areas only full service Resort our goal is for you to have no worries, just ride. Leave your trailer at your site, gas up at the store and enjoy the days ride. When you return enjoy a hot meal from the kitchen and an evening relaxing by your campfire while listening to the river roll by. Just outside the Pocahontas Trail, with the Indian Ridge and Pinnacle Trail also near. At our lodge, off-roading enthusiasts have lots of easy parking and can ride directly to the trails. This lodge includes, "The Backwoods Room", sleeps 4 adults on twin XL bunks, micro kitchenette, 1-full bath room, deck, seating area, grill, fire pit ring, large picnic table, corn hole boards, horse shoe ring, secure parking, and many more amenities... "The Loft" sleeps 6 adults on two queen beds and two XL twins , kitchenette, 1-full bath room, front porch, seating area, grill, fire pit ring, large Picnic table, corn hole boards, horse shoe ring, secure parking, dining area, and many more amenities... "The House" sleeps 14 adults comfortably on 1 king bed, 2 queen beds, 1 full bed, and 6 twin XL beds. The House includes a fully furnished kitchen with dining area, Living Room, and 3 full baths, 1 with a jetted Jacuzzi tub. Amenities include covered deck and porch, charcoal and gas grills, multiple fire pits, picnic tables, corn hole boards, horse shoe ring, secured parking, just to name a few. Give us a call today! Pocahontas ATV Resort is located in historic Bramwell WV, smack dab in the middle of some great trails. We are .5 miles away from the Original Pocahontas on the Spearhead Trail System and 3.2 miles from Pocahontas Hatfield McCoy trails which also gives you access to Indian Ridge and Pinnacle Creek! We have 11 cabins (5 brand new cabins opened May 2016), 2 RV spaces, a bathhouse and a lodge where your entire party can get together after a day on the trails and share your adventures. Our manager, Melinda, is always available to make your stay affordable and comfortable. Come experience a resort where you can ride and relax in wild, wonderful West Virginia! The Quality Hotel and Conference Center in Bluefield, West Virginia The Quality Hotel® and Conference Center offers both business and leisure travelers numerous features and excellent service at a great location. Local points of interest close to this Bluefield, WV hotel include: •Bluefield State College •East River Mountain Overlook •Bluefield Area Arts Center Numerous movie theaters, entertainment venues and cultural attractions can be found in the surrounding area. There are many shopping and dining options nearby. As a guest of this West Virginia hotel, you can enjoy amenities like: •Free deluxe continental breakfast and free coffee in the lobby •Free daily newspaper •Free wireless high-speed Internet access •Outdoor heated pool •Fitness center and sauna Corporate travelers will welcome additional conveniences provided in the on-site business center including access to copy and fax service. This West Virginia hotel boasts six banquet and meeting rooms that can accommodate up to 500 people. Whether you want to host a business seminar, family reunion or large social gathering, the Quality Hotel and Conference Center can accommodate your next special event. All of our warm and inviting guest rooms are furnished with pillow-top mattresses, coffee makers, curved shower rods, hair dryers, irons, ironing boards, voice mail. Ask about our rooms that have flat-screen televisions, microwaves, refrigerators and sofa sleepers. Non-smoking rooms can be requested. Ample parking is provided at this pet-friendly hotel and can accommodate most vehicles. The Quality Hotel and Conference Center offers outstanding service, inviting rooms and countless features. Make us your home away from home when you are in West Virginia and we'll make your stay memorable. Book a room with us today. 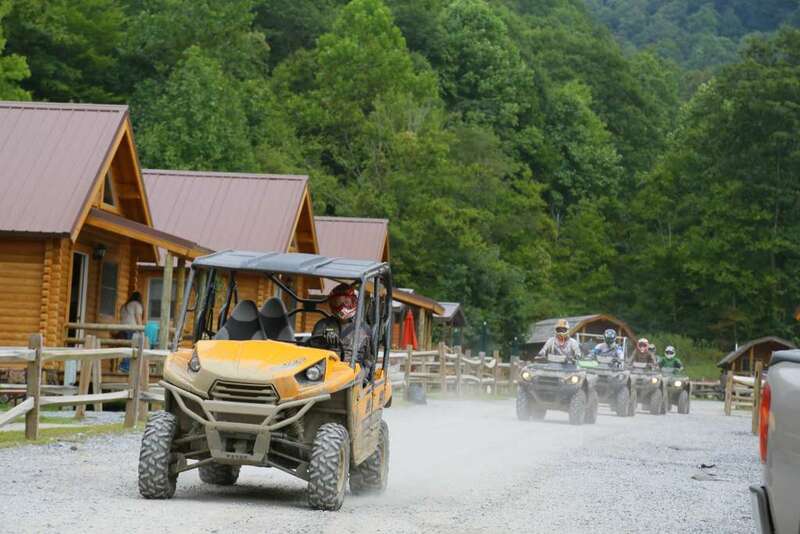 Welcome to Southern West Virginia's newest ATV resort!!! Buffalo Trail Cabins, Cottage, and Campground is convenienty located on route 71 only 1/4 mile from route 52 and 3.5 miles from the Pocahontas Trail Head on the Hatfield McCoy Trail System. Buffalo Trail offers rental property built specifically to meet the needs of ATV riders and their families!!! Buffalo Trail offers many amenities and conveniences including: Log Cabins, Stone Cottages, RV sites with full hook-ups, on-site office, restaurant, general store, 33 foot concrete drive, outdoor woodburning grills/fire-pits, scenic waterfall, unlimited Wi-Fi Access, free ice machine. The Real McCoy Cabins are family owned and operated. We are riders, just like you. Our cabins are top of the line, custom designed by us and handcrafted by local contractors. Rustic luxury is exactly what we’ve brought to life here in the historic Town of Pocahontas, Virginia. Tucked away in a private hollow, this is the perfect getaway from the hustle and bustle of city life. Drive your machine from your cabin to the trails in Bramwell, WV as well as Pocahontas, VA. Pull on up, unhook your trailer and enjoy the ride along ATV-friendly roads. While you’re at it, come on in and have a bite to eat at The Real McCoy Country Store and Kitchen where Southern Hospitality is alive and well! Home cooked meals just like Grandma used to make. At The Real McCoy Cabins, comfort and convenience of our guests is our priority. In order to serve you best, linens are included at no extra charge and we now have a laundry facility onsite for your use as well. Come on out and see what has everyone talking! Accommodations for up to 18 adults in 3 adjacent units. Conveniently located near the Indian Ridge Hatfield McCoy Trail Head and less than an hour from the Pinnacle Creek Trail Head. Additional miles of unpaved roads nearby. Immediate access to trails - no need to haul or trailer ATVs. Weekend, weekday, and weekly rate packages available. Units have full kitchen and laundry facilities. Color 25" TV featuring satellite service (all premium channels) and DVD Player in each unit. Electric heat and air conditioning in both units. Private parking for trucks, trailers and ATVs. Linen (towels & sheets) and cleaning included in price of rental. Excellent catering services available at reasonable rates. Located 3 hours from Winston Salem, NC and 2 hours from Charleston, WV, Bristol, TN, and Roanoke, VA. Located on 200 scenic and serene mountaintop acres. All Paved Access-No dusty roads to soil your truck! Visa and MasterCard Accepted. This recently renovated property is located in the safe and friendly town of Mullens, West Virginia. We are just a short ATV ride to the Pinnacle Creek Trail System, which also connects to the Indian Ridge and Pocahontas Trail Systems. Mullens is an ATV-friendly town located just minutes from Beckley, West Virginia and Interstates 64 and 77. In town, you have access to gas stations, grocery stores, restaurants and a car wash to spray off your machines! This property features: 6 double beds, a full kitchen, living room, dining room, washer and dryer, central heat and air, plenty of parking, fire pit, grill and a large private patio with a hot tub that makes this location the perfect getaway. Please contact me for more details on this home and all the wonderful outdoor activities this area has to offer. Nestled amidst 1,600 acres of private hardwood forest, ASHLAND RESORT is the largest campground in the Hatfield-McCoy Trail System and the only Guest Rated, “A” camping facility in West Virginia. Ashland Resort offers the perfect friends and family lodging location for ATV & Dirt Bike enthusiasts with a selection of Lodges, Cottages and Cabins, RV and tent sites plus a Camp Store. Ashland Resort provides the unique combination of an award winning Campground and an award winning Hatfield-McCoy Trail System. Featuring plush lodges, rustic cottages, and basic camping cabins plus an array of RV and tent camping facilities, Ashland Resort offers convenience and comfort. The campground bathhouse is centrally located to RV and tent sites. All lodging sites feature fire pits, picnic tables, and WiFi. RV sites are available with varying degrees of convenience ranging from basic water, electric and TV cable to long full service pull-through sites. Cabins feature heat and AC plus TV, small refrigerator, microwave, outdoor grills. Step up to Ashland Cottages for full baths, patios and more. Most include kitchenettes. Lodges include a touch of class with full size kitchen appliances. Facilities are complimented by our hosts and associates who welcome guests as friends and family. The Indian Ridge Trail passes through the Campground. Leave your trailer at your campsite, gas up at the Camp Store, and concentrate on enjoying the wild and wonderful trails. Choose family friendly green trails or dare to be challenged on black and single track dirt bike trails. Enjoy vistas, wildlife and endless miles of canopied forests throughout our remote, rugged terrain. Split the mud holes or take the high road. Our mountain challenge awaits you. The Ashland Resort Camp Store completes the retreat package. In addition to offering Hatfield-McCoy trail permits, the Store is packed with essentials. Snacks, groceries, ATV emergency supplies & accessories, RV stuff, riding gloves & helmets, and more are in the base camp. LP and gasoline complete the offering. Trail maps and the latest trail gossip are readily available. Ashland Resort affords guest riders direct access to three Hatfield-McCoy Trail Systems and 250 miles of connected managed trails. Centrally located and imbedded within Hatfield-McCoy’s Indian Ridge Trail System, Ashland Resort is conveniently located with direct trail access to the adjoining Pinnacle Creek and the new Pocahontas Trail Systems. Crazy Mountain Cycles has the largest selection of UTV's anywhere in southern WV. We're the only place that offers RZR XP1000, XP4, RZR RS1 RZR Turbo, and CanAm X3's. Weekday specials avail, rent two machines for two days and stay two nights for free! We also offer lodging! Your one-stop shop! Bramwell ATV Resort is located directly on Trail 10 of the Pocahontas Trail and on the banks of the beautiful Bluestone River. Ride Pocahontas, Indian Ridge and Pinnacle Creek Trails without having to trailer your ATV’s once offloaded at our site. Our current rental inventory includes two cabins, two efficiency style rooms and one full size house. Two additional apartments are under development and opening soon! Cabins 1 & 2 sleep 8 people each, or a party of 16 if you open the double lockout doors between the two cabins. Efficiency Room # 1 can sleep 4 to 7 guests and Efficiency Room # 2 can sleep 3 to 5 guests, or open the double lockout doors to accommodate 7 to 12 people. Our full size house has 3 bedrooms, two full baths and a spacious living room, dining room and kitchen. All facilities are heated, air-conditioned and include kitchenette (or full kitchen), full interior private bathroom, cable TV, Wifi, bed linens and bath towels. All kitchen facilities are furnished with a sink, refrigerator, microwave, stove (or stove top burners), coffee maker, toaster, pots & pans, dishes and cooking/eating utensils. A convenience store (Bramwell Pop Shop) with gas pumps and the Riverside Grille are immediately next door. Two more restaurants/café’s are within ¾ mile and accessible by ATV. Enjoy your evening on the river bank barbequing on the gas grill and relaxing beside the campfire. We sell Hatfield McCoy Trail Permits and have many other amenities and conveniences, making us the #1 Rider Destination in Bramwell. Please visit our website: www.bramwellatvresort.com for further details. We accept Visa, Master Card, Discover and American Express. Bramwell ATV Resort is a Veteran Owned and Operated small business. The Corner Shop is a delightful old fashioned soda fountain & Diner located in Historic Bramwell, WV. Formerly the Bryant Pharmacy, it is beautiful and memorable trip back in time!!! Your Southern West Virginia ATV adventure starts here! Just a stone's throw from the Hatfield McCoy trail system, a stay at our spacious mountainside lodge will make the time spent off the trails just as fun and relaxing as the hours spent riding your ATV through the scenic West Virginia mountains. After a long day of ATV riding, you can enjoy our many amenities, such as grilling, horseshoes, corn-hole boards, outdoor fire pit, and swimming pool (opening Summer 2011). Located 1 1/2 miles from Route #52W on Power House Hill Road in Maybeury, West Virginia, this lodge can accommodate up to 8 guests in each of the 2 units. The upstairs unit is your home away from home with 2 bedrooms, a deluxe kitchen, and living room with TV, shower, and bathroom. The downstairs unit is our bunkhouse. It consists of one large sleeping area with 4 bunk beds, kitchen, TV area, showers, and bathroom. We have a large secure parking area with plenty of room for loading and unloading of ATV trailers. Our ATV lodge is located on the grounds of the National Historic Landmark home of the famous coal baron, James Ellwood Jones. We offer complementary tours of the historic mansion for all ATV Lodge guests. TIRES, PARTS & ACCESSORIES We have high octane fuel, souvenirs, general store, and food. We can perform minor repairs and stock tires, parts and accessories for ATVs/ UTVs. Stop by and see us on your next trip. You’ll be glad you did. Four Wheeler Heaven is located on U.S. Route 52 just 20 minutes from I-77 and adjacent to the future Hatfield-McCoy Trails’ Pocahontas Trail trailhead in Coaldale, WV. More than 200 miles of the Hatfield-McCoy Trails are directly accessible from Four Wheeler Heaven via the Pocahontas trail system, which is connected to to the Indian Ridge and Pinnacle Creek trail systems. No need to haul your ATVs to the trail from Four Wheeler Heaven! Four Wheeler Heaven features three rental units in one large house. Blizzards Roost features 3 bedrooms and 2 full baths with a full kitchen, dining room, sun room, living room and a washer/dryer. It will sleep 10 easily and is fully equipped with towels, linens, utensils, coffeemaker and crock pot - basically everything you need. Coaldale Condo is a large, newly-built 1-bedroom 1-bathroom unit that sleeps up to 6, and the Coaldale Condo lock-out unit is a smaller 2-bedroom, 1-bathroom unit that can sleep up to 6. Both Coaldale Condo units can be rented together at a discounted price for groups of up to 12 people. All units feature a living room with an HD television, Dish Network TV service, kitchen with dishes and utensils, and Internet service. All guests have access to a large above-ground swimming pool (summer only), an outdoor patio and grill (bring your own charcoal), and an outdoor water hose for washing off your machines. There is plenty of room to park your vehicles and unhook your trailers so you can go out on the town after a full day of trail riding - we have secure, dry parking for your ATVs and security cameras on the premises. Visit fourwheelerheaven.com to learn more about each rental unit, check availability and book your week or weekend on the trail using our online booking system! All major credit cards accepted. Ride the trails and camp with us! Large lots, 30 & 50 amp sites, multi vehicle spaces, camp store on site, NEW bath houses, storage for your ATV or camper. We are close to all major highways, restaurants and shops! Bramwell Hill Manor is an ATV friendly lodge located on a hill over-looking the town of Bramwell, WV. It is 1/4 mile from the Hatfield McCoy's Pocahontas Trail. The lodge has 4 bedrooms and 1 1/2 baths. The kitchen is available to guests as well as the covered patio and BBQ grill. There is parking in the rear of the house for your truck and trailer. Unload once and have more time to ride the trails. Two restaurants are located with-in walking distance from the lodge on Bramwell's Mainstreet. Come stay at Bramwell Hill Manor and enjoy the Pocahontas trail and the Home of the Millionaries. For more information call 276-245-5574 or 470-232-8047. Trailhead Adventures offers Polaris RZR S 900’s with both 2 seats and 4 seats for rent. We are located just a short distance on ATV friendly roads from the Hatfield McCoy Pocahontas Trail in Bramwell, WV. We are an official Polaris Adventures Outfitter.